On the Indy 500 Motor Speedway website it states that “it’s easy to say that auto racing history is made at the Indianapolis 500. But it’s probably more accurate to say auto racing history is the Indianapolis 500. The races are legendary. The 500 miles each year are circular path to immortality for the winner. This Great Race is rich in history, with agony and ecstasy, triumph and tragedy. 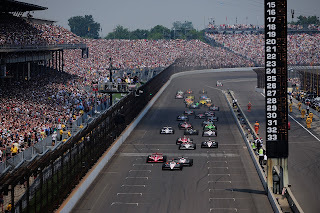 The track is hallowed ground.” All of us at Silla could not agree more… The Indy 500 is held annually on Memorial Day week- end at the Indianapolis Motor Speedway in Speedway, Indiana. The event is considered one of the three most significant motorsports events in the world. The race only allows vehicles to compete that are Indy-Car or Formula Class of open-wheel race cars. Approximately 400,000 people attend the race each year. Traditionally, the field consists of 33 cars, aligned in a starting grid of eleven rows of three cars across. The track is a 2.5 mile oval circuit and the race consists of 200 laps, run counterclockwise around the circuit, for a distance of 500 miles. All entrants utilize 2.4L V6 turbocharged en- gines, tuned to produce a range of 550 to 700 horsepower. In 2011, the total purse exceeded $13 million, with over $2.5 million awarded to the winner, making it one of the richest prizes in all of sports. The Indianapolis Motor Speedway complex was built in 1909 as a gravel-and-tar track and hosted various racing events. The first long distance race was the 100-lap Prest- O-Lite Trophy in 1909, won by Bob Burman in a Buick. The first “500” was held at the Speedway on Memorial Day, May 30, 1911, with a field of 40 cars. Ray Harroun driv- ing a Marmon Model 32-based Wasp racer was declared the winner. In 1912, the field was limited to 33, where it remains today and the annual tradition was established. Although the first race was won by an American driver at the wheel of an American car, European makers such as Fiat and Peugeot soon developed their own vehicles and won the event from 1912 to 1919. After World War I, American drivers and manufacturers regained their domi- nance of the race and the European car makers disap- peared for nearly two decades. Since the 1981 race, the name “65th Indianapolis 500- Mile Race” was officially adopted, and each year a new annual logo is developed and the race was changed to an invitational only event. In 2009, the Indianapolis Motor Speedway began a three-year long “Centennial Era” to celebrate its 100th anniversary. However, since the race was not held during WWI and WWII, the 2009 race was actually the 93rd run- ning and later this month the race will be run for the 96th time in its history. This race has become an American institution that is famous around the world. Certainly no other race in the world has the legends, traditions and history like the Indy 500. Like millions of other fans, the Radiator Express Team will be watching the Great Race on Memorial Day.